Gary Sullivan is a clock and furniture dealer, as well as an appraiser for “Antiques Roadshow.” In this scholarly interview, Sullivan explains the differences between early American tall-case, banjo, and dwarf clocks and offers tips on what to watch out for when buying these popular antiques. Sullivan’s book, “Harbor and Home: Furniture of Southeastern Massachusetts, 1710-1850,” was published last year. He can be reached via his website, www.garysullivanantiques.com. A fine tall-case clock by Joshua Wilder, Hingham, circa 1820. As a teenager, I got into repairing the old furniture in our attic. One day, I wandered into a local antiques shop and asked the guy there if he had anything that needed to be repaired. He gave me a few things to do. It just happened that he was a clock specialist, and he introduced me to other clock dealers. So from a pretty young age, I was repairing and refinishing clock cases. I very quickly transitioned from repairing to buying and selling. I’ve been doing appraisal work for probably 25 years and have been a fulltime antiques dealer since 1975. I’ve survived, and that hasn’t been easy. I learned by making mistakes. I did minor repairs and refinishing for Boston-area dealers. But I quickly moved into buying, fixing, and selling. Now I just buy and sell. I specialize in early American clocks because, for one, I think they’re beautiful. They’re more interesting than their European counterparts. English and Scottish clocks are pretty similar, and the cases are not that well made. They didn’t have access to the secondary wood we did here. They’re made of very thin wood. There’s more variety in the American clocks. I deal in a very high-end market for both furniture and clocks. The American clocks, for the most part, are in a different price range than the more common English and Scottish clocks. There are very high-end English clocks, but I don’t handle many. My book, “Harbor and Home: Furniture of Southeastern Massachusetts, 1710-1850,” came out last year. I wrote it with Brock Jobe, a highly regarded author who’s associated with Winterthur Museum, and Jack O’Brien. I contributed to the furniture section of the book and wrote the clock section, which is almost a third of the book. Clockmaking was a significant industry in southeastern Massachusetts in the late 18th and early 19th centuries. They made some really wonderful clocks there. Although, I handle clocks from all over the country, I specialize in ones from New England, with an emphasis on clocks from Massachusetts. Before 1825, most of the clocks were made in New England and the Mid-Atlantic States. I’m particularly interested in collecting clocks of southeastern Massachusetts. Some people call them south shore clocks because they were made south of Boston. I’ve been interested in collecting clocks from that region for many years. But I don’t have a tremendous collection of my own. I’m still putting kids through college. Collectors Weekly: When did U.S. clock manufacturing begin? Sullivan: It began in the colonies in the mid-18th century. Prior to about 1785, few clocks were made in this country. Probably less than 10 percent of the households had a clock of any kind. Around 1800, clockmaking began to take off, and they became a little bit cheaper. The economy improved, so a few more people could afford clocks. An important banjo clock by Simon Willard, Roxbury, circa 1807. The early American clockmakers did other things besides making clocks. For example, the account book of Calvin Bailey, a clockmaker from southeastern Massachusetts, is a treasure trove of information on how business was conducted in the late 18th and early 19th centuries. Clockmakers of this period lived in an agrarian society in which work ebbed and flowed according to the seasons. Many were farmers in addition to being clockmakers, so they would concentrate the majority of their clockwork into the winter season and farm during the warmer months. At that time, very little cash changed hands in the colonies. People kept account books, and they used the barter system. For example, in Calvin Bailey’s account book, there are very few entries in which someone actually paid him for a clock. It would usually go on that person’s account. Bailey bartered clocks for all kinds of things. He bartered a set of clockworks to a local carpenter, who then built the frame for his house. People carried accounts for years and would make entries for the smallest things—making a delivery for somebody, loaning them your oxen for a day, cutting hay in their field. Around 1815, less expensive clocks with wooden works and gears began being mass-produced in Connecticut. They were cheaper than the earlier brass works clocks made by individuals, which are the ones I handle. Collectors Weekly: Why did the clockmakers set up shop in Connecticut? Sullivan: A group of clockmakers developed the methods for mass-producing wooden clockworks because brass was very expensive. When they began making them in large factories later in the 19th century, the individual clockmakers couldn’t compete because the clocks were being made so cheaply. In the early 19th century, a tall-case clock or grandfather clock—we call them tall-case clocks in the business—cost about $70. For many people, that was equivalent to a year’s pay. But by about 1850, you could buy a clock for $2. So in a relatively short period, you went from very few households having a clock to just about anyone having an inexpensive one. They were quite common. There were a number of clockmakers in Boston, up into Maine, and in New Hampshire, as well as in New Jersey and Pennsylvania. I guess Massachusetts, Connecticut, Pennsylvania, and New Jersey produced the greatest numbers. The early 18th-century clocks had brass dials—we refer to the face of the clock as the dial. The case might be very elaborate depending on where it was made. But most of the very first clocks made in this country had relatively simple cases. At that time, tall-case clocks were the only clocks being made in this country. Later in the 18th century, bracket clocks began being imported from England. They were small, spring-driven table clocks as opposed to a weight-driven tall-case clock. A tall-case clock needs the cabinet height to house the pendulum, which is about 3 feet long. The weights need several feet of drop to run the clock for a week. You wind them up once a week, and then they fall almost to the floor, and you wind it up again. That was the technology at the time. Later, clockmakers learned how to make a clock run for a week with a shorter drop of the weight. Simon Willard in Roxbury, Massachusetts, patented the banjo clock, or the patent timepiece, in 1802. That was a much smaller clock and a little less expensive. Tall-case clocks were made in different sizes based on the stylistic preferences of the region. Some very early Massachusetts clocks had relatively short cases of maybe 6 1/2 feet tall. A few years later, elaborate 9-foot-tall cases were made in Philadelphia. But the average tall-case clock was about 7 1/2 to 8 feet tall. Collectors Weekly: Did European craftsmen influence American clock design? Sullivan: Yes, because many of the clockmakers here were trained in Europe. The clock movements—the brass components that actually run the clock—were virtually identical to what was being made in England. The clock movements or clockworks made here around 1800 are indistinguishable from those being made in London except for occasional minor stylistic differences. Collectors Weekly: Who were some of the earliest clockmakers in America? Sullivan: The Blaisdells of Amesbury, Massachusetts, were a family of blacksmiths who made crude iron and brass clock movements. They were among the earliest makers in this country. The most significant clockmakers were arguably the Willard family of Grafton and Roxbury, Massachusetts. Simon Willard was the granddaddy of American clockmakers. He started work in Grafton, moved to Boston, and with his brother Aaron produced thousands of clocks there. They were very successful, and their work is highly sought after because of the craftsmanship and the beauty of the cases. They produced Roxbury tall-case clocks, which are beautifully proportioned and very well executed. The Roxbury cases were fashioned after the clocks being made in London. They’re similar, but the Roxbury cases had their own American twist. Simon had two other brothers, Benjamin and Ephraim. They were also important makers. Collectors Weekly: Who were some of the other prolific clockmakers? Sullivan: The Mulliken family of clockmakers worked in various towns—Lexington, Concord. They were significant makers. A man named David Wood in Newburyport, Massachusetts, produced very fine clocks, including many of a style know as the Massachusetts shelf clock, which are much shorter. They stand about 3 1/2 feet high and are designed to sit on a piece of furniture, a mantel, or a shelf. They’re highly sought after. He made some beautiful scaled-down versions of a tall-case clock. A tall-case clock by Aaron Willard, Boston, circa 1800. Another prolific maker was Joshua Wilder who worked in Hingham, Massachusetts. He was one of the makers that I studied for “Harbor and Home.” He produced a lot of dwarf clocks, which are exact miniatures of tall-case clocks. They have the same design and proportions, but they’re about half the size, usually about 4 feet tall. They’re highly prized by collectors and often sell for much more than a full-size version. They were made in relatively small numbers, and they’re very attractive clocks. They’re unusual, interesting, and they tell a story. The Bailey family of Hanover—brothers John and Calvin were the most important clockmakers south of Boston—first developed the dwarf clock. They didn’t make that many, but Joshua Wilder, who was an apprentice of John Bailey, produced them in much larger numbers. His apprentice Reuben Tower did as well. They developed dwarf clocks in southeastern Massachusetts because Simon Willard patented the banjo clock in 1802. It was much smaller, obviously, than a tall-case clock and less expensive. The banjo clock cost only $55 when it came out, compared to $70 for a tall-case clock. Over the next several years, the price dropped to about $20 for a banjo clock. This put pressure on the southeastern Massachusetts makers because Willard allowed his associates and apprentices to make banjo clocks fashioned after his patent, but did not allow southeastern Massachusetts makers to produce them. So a lot of banjo clocks were being produced in the Boston area. By about 1812, there were very few tall-case clocks being produced in Boston because cheaper clocks had largely replaced them. That’s when dwarf clocks became popular in the Hingham and Hanover area because they were smaller and less expensive to produce. Instead of costing $65 or $70, they were $35 to $45. Collectors Weekly: Did the tall-case clockmakers start making dwarf clocks? Sullivan: No. Most of the dwarf clocks were produced in the Hingham and Hanover area of Massachusetts. A few were made in other places, like Maine. But the Baileys and their apprentices produced almost all of them. Being so close to Boston, their clientele had the option of buying a banjo clock instead of an expensive tall-case clock. Farther away from Boston, up into Maine or New Hampshire, they kept making tall-case clocks because their clientele didn’t have easy access to the cheaper banjo clocks. They probably didn’t even know about them, with some exceptions. Clockmakers continued making a lot of tall-case clocks in New Jersey and Pennsylvania for many years after they stopped making them in Boston. Collectors Weekly: What did the Boston clockmakers do after they stopped making tall-case clocks? Sullivan: They made banjo clocks instead. By 1820, the clocks coming out of Connecticut were changing the market. Many of the traditional clockmakers branched out and started doing other work because making clock movements one at a time was no longer profitable. They started making, selling, and repairing jewelry. A lot of them became jewelers and clock repairmen. A lot of the less expensive clocks produced in Connecticut needed people to work on them and keep them running. So the traditional clockmakers became repairmen. More people were also carrying pocket watches, so they repaired and sold those. Many of the clockmakers became silversmiths and goldsmiths. They were often jacks-of-all-trades. They would also do gunsmithing and metalwork for jewelry. Collectors Weekly: Was clockmaking mostly a family business? Sullivan: The clockmakers would often train their sons or relatives. In southeastern Massachusetts, a lot of clockmakers were Quakers. A Quaker clockmaker would be more likely to take on the child of one of his Quaker associates as an apprentice than someone unknown. So a lot of the apprentices were Quakers, too. That was also true in cabinetmaking in southeastern Massachusetts. A very rare Bride’s model stenciled and eglomisé “Massachusetts Shelf Clock” by Ezekiel Jones, Boston, circa 1820. A lot of people don’t really understand that clockmakers only made the inner workings for the clocks, not the cases. Simon Willard, for example, made the part of the clock that you can’t see—the works behind the dial. He was the clockmaker. You had to be trained in that field. In almost every case, different people made the clockworks and the case. Only in very rare cases in rural areas would the same maker produce both, Long Island being one of the exceptions. The Dominy family made the clockworks and the cases there. The dial would be produced by a dial maker who was an ornamental artist. So they would create or purchase the iron plate for the dial, paint it, and decorate it with the face of the clock. That was another industry and another craftsman involved in making a tall-case clock. Before they made dials here, they were ordered from Birmingham, England. But by about 1805, most of the dials used in this country were made in Boston. So Willard may not have done everything, but what he did do was very significant. And Willard’s greatest contribution to clockmaking was clearly the patent timepiece or banjo clock. Condensing a weight-driven clock into a small device that hangs on the wall was a tremendous innovation. Another important development was the Connecticut clockmakers’ system for producing large numbers of clock movements at a lower price. Because Connecticut clocks are easier to find, there are probably more collectors of Connecticut-production, mid-19th-century clocks than collectors of the earlier tall-case clocks. Some are very beautiful, rare, and highly sought after. But, for the most part, they’re not nearly as valuable as the tall-case clocks. Among the early Connecticut manufacturers, the Seth Thomas Company survived well into the 20th century. Silas Hoadley was another early maker. Initially they made wooden movements for tall-case clocks and shipped them all over the country. They would make the movement and the dial in Connecticut, and then it could be shipped anywhere. The local merchant or person who bought it could have a case made locally for the set of works. Collectors Weekly: What kind of wood was used to make the cabinets? Sullivan: The clocks made along the New England coast were primarily made of mahogany. Clocks made farther inland would be made of cherry, which was mainly used in Connecticut. They could be maple or birch. In New England, secondary wood was generally white pine. Collectors Weekly: Do collectors prefer a certain type of wood? Sullivan: It depends on the region. In Pennsylvania, it’s walnut. Connecticut collectors like cherry. There are so many variables in clockmaking that for every question, I almost have to say, “What region and year are you talking about?” They were doing different things in different places. Collectors Weekly: Do clockmakers still make tall-case clocks today? Sullivan: You can buy brand new tall-case clocks. I don’t really don’t understand why anyone would buy one because as soon as you take it out of the store, it’s worth a fraction of what you just paid for it. But if you buy an antique, it’s likely to appreciate in value. A rare tall-case clock by Calvin Bailey, Hanover, circa 1805. I should mention that antique tall-case clocks are prone to significant alteration and condition problems. They were relatively tall when they were originally made. So very often an individual purchased or inherited a clock and wanted to move it to a house with lower ceilings. They’d either remove or cut down the feet or the fretwork on the top. Mid-Atlantic clocks have a scroll pediment that might be cut off. That’s very common. New England clocks typically have delicate, pierced fretwork on the top. It can break if mishandled. So it’s often broken or it’s been repaired or replaced. Through the second half of the 19th century, they were just old clocks with very little value. If one clock movement stopped working properly, they might take that set of works—the dial is connected to the works—out of the case and substitute it for another one. We call that a marriage, which is a common problem in clocks. Another common problem is that the paint on the dials can deteriorate. They’re often heavily restored or repainted. So there are several common condition problems. I’d say only about 10 percent of the surviving tall-case clocks are largely original—original feet, fretwork, not married, original paint on the dial. Because originals are hard to find they’re expensive. A novice collector looking through auction catalogs is really going to be confused by the variety of prices. Unless you have a complete understanding of what’s original and what isn’t, it’s difficult to get a handle on what the market is. It’s not unusual to see a clock made by Simon or Aaron Willard sell for $10,000 to $20,000 at auction. That would be a lesser one. At $10,000 to $20,000 there’s something wrong with it. It has replaced feet or fretwork or both. You might look in a different auction catalogue and see a clock that looks just like it selling for $100,000. You may not be able to see any difference between the two photos. But the one selling for $100,000 or more is perfect. It has all of its original components with no alterations. The collectors want originality, and they will pay for it. Collectors Weekly: Did the clockmakers mark their clocks in some way? Sullivan: Most makers put their name on the dial. An Aaron Willard clock says “Aaron Willard, Boston” right on the face. But they didn’t always put their names on them. A lot of beautiful American clocks have no name on the dial. I often wondered why the clockmaker wouldn’t put his name on the face after putting all that effort into making the movement. But I found that in some cases the clocks were being sold to the retail consumer by the cabinetmaker instead of the clockmaker. This is contrary to the way we originally thought business was done, which was that the clockmaker would purchase the dial, make the movement, buy a case from the cabinetmaker, put them together, and then sell the clock to the end user. Collectors Weekly: How do you determine where the different components came from? An early “Massachusetts Shelf Clock” by Aaron Willard, Boston, circa 1800. Sullivan: There are regional characteristics to the cases. Clock scholars can almost always identify the region where a case was made. You occasionally see a generic case from rural areas: It could be New Hampshire, Maine, or western Massachusetts. But generally speaking we can identify the region based on the style of the fretwork and the feet, the proportions of the case, the types of wood used. There are many variables. Also, specific patterns tend to be associated with particular craftsmen. The Roxbury cases used by the Willards generally have two or three different styles of fretwork on the cases. You can find certain common patterns and fretwork in southeastern Massachusetts even among different cabinetmakers. For example, certain patterns would be more particular to coastal Maine. As far as the dials went, the manufacturers usually marked the imported Birmingham dials with “Birmingham” on the back. The American ones, most of which were made in Boston, bear motifs associated with Boston that make them easy to identify. Samuel Curtis, a prolific Boston dial maker, left Massachusetts as the tall-case clock business was waning there and moved to Philadelphia, where they were still making a lot of them. There were also dial makers with their own regional characteristics in places like Western Massachusetts, Maine, and Philadelphia—though I wouldn’t include Curtis. I consider him to be a Boston maker. Fans in the corners or shields were popular motifs on Boston dials. Some of the dials are moon-faced. They have a revolving moon disc in the top. Painted scenes at the top are another motif. Some depict naval engagements, and those are very popular with collectors. Collectors Weekly: How did the term grandfather become associated with tall-case clocks? Sullivan: I have no idea. It’s only speculation that the clocks were called that because they were passed down from previous generations. At the time they were originally made, they were referred to as a clock-and-case. In the period account books, if they say clock, that refers to just the works, the movement and the dial. If it’s complete, it’s called a clock-and-case. In the late 19th and early 20th centuries, they tended to call them hall clocks. Dwarf clocks are commonly referred to as grandmother clocks. I think the term is less common than it used to be. It’s kind of a layman’s term. We don’t call them grandmother clocks in the business. Collectors Weekly: Who typically bought a tall-case clock? Sullivan: The wealthiest members of society. Exactly what they did, I don’t know. Not everyone had a clock in the home. Time wasn’t the important commodity it is today. You had a sundial maybe, which was less expensive, or you relied on the clock in the center of town to tell you when it was time to go to services. Many people didn’t really need to know what time it was. They didn’t have a watch either. Sometimes you wish you could go back to the way it was then. Collectors Weekly: How many people would typically be involved in building a tall-case clock? 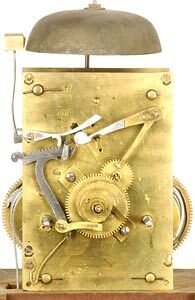 A tall-case clock movement by William Cummens, Roxbury, circa 1810. Sullivan: There’s the movement, which was made by individual clockmakers—the ones I deal in are made of brass. There was the dial maker. The earlier dials could be made of brass or painted on in the later ones. A cabinetmaker made the case, and separate artisans built its various components. For example, the brass components would’ve been made by a founder, and the glass in the door would’ve been made by a glassmaker. Sometimes the finish was done by the cabinetmaker, but in many cases it would be done by a separate finisher. The clock was powered by weights, which were often made of iron. They would’ve been produced in a foundry. Also, if the case has inlay, a stringer or an inlay maker might have produced it. Some cabinetmakers made their own inlay, but others purchased it. You could buy imported inlay from England or you could buy it in the cities, locally made. Collectors Weekly: What’s the rarest clock you’ve ever appraised? Sullivan: Some of the rarest and most interesting ones I’ve appraised have been Simon Willard lighthouse clocks. They resemble a lighthouse. They have a wooden base with the clock movement resting on it, covered by a glass dome. I’ve appraised a number of them, and they’re among my favorites. I’m helping the Willard Museum in North Grafton locate privately held lighthouse clocks to be included in a catalog they’re sponsoring. Paul Foley, who wrote a fantastic book on banjo clocks, is writing it. There are still lighthouse clocks out there in private hands that we haven’t documented for our research. So we are trying to track them down. Collectors Weekly: Have you ever not been able to figure out where a tall-case clock came from? Sullivan: Oh sure, although we can usually narrow it down. In the worst cases we say “generic New England.” That refers to a very plain clock. It just doesn’t have the form cues that we need to place it in a specific town or area. But the high-style clocks, they’re pretty easy to place. Collectors Weekly: What advice do you have for someone who is new to clock collecting? Sullivan: The first thing to do is to take advantage of the resources that are out there. For very high-end clocks, you can see more examples on my website than on any other. There are also a number of clocks at Delaney Antique Clocks. Very fine and rare Lighthouse clock by Simon Willard, circa 1825. The best book on American clocks is “Willard’s Patent Timepieces” by Paul Foley. Although it masquerades as a book on banjo clocks, it actually has a lot of information on clockmakers and clockmaking in general. I refer to it every day. Another resource for people interested in clocks or collecting is the website for the National Association of Watch and Clock Collectors. They have message boards where people share their knowledge so you can ask questions and communicate with other people who are interested in clocks. As far as early American clocks, my advice would be to work with a reputable dealer, someone who is going to guarantee what they sell. You can make tremendous mistakes by buying a clock from someone who’s not a clock specialist. They may have the best intentions, but they lack detailed knowledge of what they are selling. You can also make big mistakes at auctions because auction houses seldom have a true clock specialist on staff. The furniture specialist is often the one who catalogs the clocks, but he or she may not know everything there is to know about clocks. That’s why I’ve been called in as an expert to help with cataloging at both Christie’s and Sotheby’s in New York. They’ve called upon me to help them with esoteric clocks. In general, I’d urge collectors to buy quality, not quantity. Buy one clock rather than 10. You want to buy clocks that have the best form and original components. Don’t buy clocks with problems. Collectors are far more sophisticated than they used to be, and they insist on quality and originality. For example, never buy a clock that has a repainted dial. I can’t sell one in my world. That’s the death of a clock. But I see them all the time. A clock with a repainted dial has very little antique value. It’s strictly an item for decoration. Collectors Weekly: How can you tell if a dial has been repainted? Sullivan: A clock specialist should be able to detect if a dial has been repainted or not. But some of them were repainted 50 or 75 years ago and they look pretty good, so it can be hard to tell. Early American clocks should have a fine crackle pattern running through the paint on the entire dial. These clocks were painted on iron, and the paint expands and contracts through the years. If you look closely and see that the paint is perfectly smooth and doesn’t have that fine crackle pattern, it’s not original paint. Don’t buy it. For more about 18th- and 19th-century tall-case clocks, check out English Clocks in American Cases from December 1940, part of our American Collector archive. I have a very nice oak Sligh Grandfather clock with the shell type bonnet on the top. I was wondering would it be out of the norm to put a small brass eagle finial on the top middle and an brass acorn on each corner. I don not know if that would take away from the value however I just think it needs something small and ornate to set it off nicely. Question for Gary Sullivan. Regarding the Mulliken family of clock (cabinet) makers. Nathaniel (working in 1760): Lexington. Joseph, Concord (working in 1790). Then Samuel and Jonathon. Can you comment on the quality of these makers? In particular Joseph? “ ” She must have been amazing, and they must have had a hell of a lot of fun.